Elon Musk's goal is to make rocket parts just as reusable as cars, planes or bicycles. MIAMI: SpaceX is poised to launch its first recycled rocket on Thursday, using a booster that sent food and supplies to the astronauts living at the International Space Station in April. Standing tall at the NASA launchpad, the white Falcon 9 rocket contains a tall, column-like portion known as the first stage, or booster, that propelled the unmanned Dragon cargo ship to space last year, then returned to an upright landing on an ocean platform. 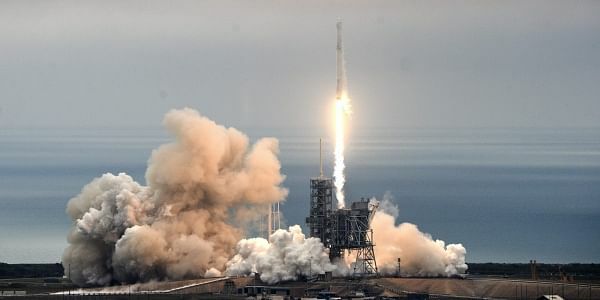 SpaceX, the California-based company headed by internet entrepreneur Elon Musk, has for years been honing the technology of powering its boosters back to careful Earth landings on solid ground and in the water. So far it has successfully landed eight -- five on so-called "drone ships" floating in the ocean, and three on land. Currently, millions of dollars worth of rocket parts are jettisoned after each launch. "I think we are on the edge of quite a significant bit of history here," he told a press conference. "Now we are here to be the first ever mission to fly on a pre-flown booster," he said. The SES-10 satellite will be sent to a geostationary orbit, flying as high as 22,000 miles (35,000 kilometers) above the Earth before maneuvering into its designated orbit.